So first I would like to say Thank You to all the great folks here of TFP! This is a wonderful community and the folks that frequent this site have been very helpful and extremely nice. My wife and I are looking at going the OB route because I feel like I can get so much more for my money if im in control and im the one spending it ( along with kim and the great folks here lol). 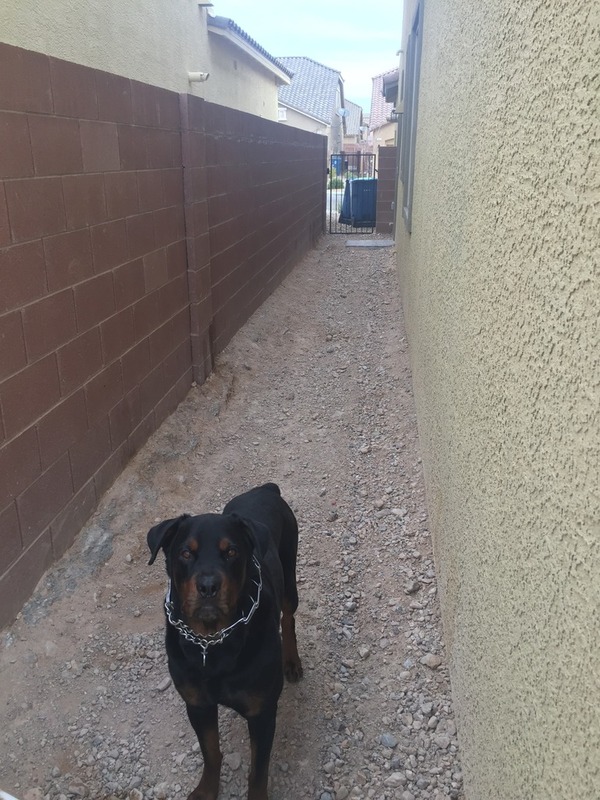 We have visited several PB in the Vegas area and could never come up with a price where we felt we were getting a good value from, so after talking to many folks on here and reading through hundreds of threads we decided to take the plunge and build it ourself. Special shout out to Quing guy and northwest vegas for providing tons of insight and pointing me in the right direction, also cant forget brian as he has responded to EVERY email i sent . 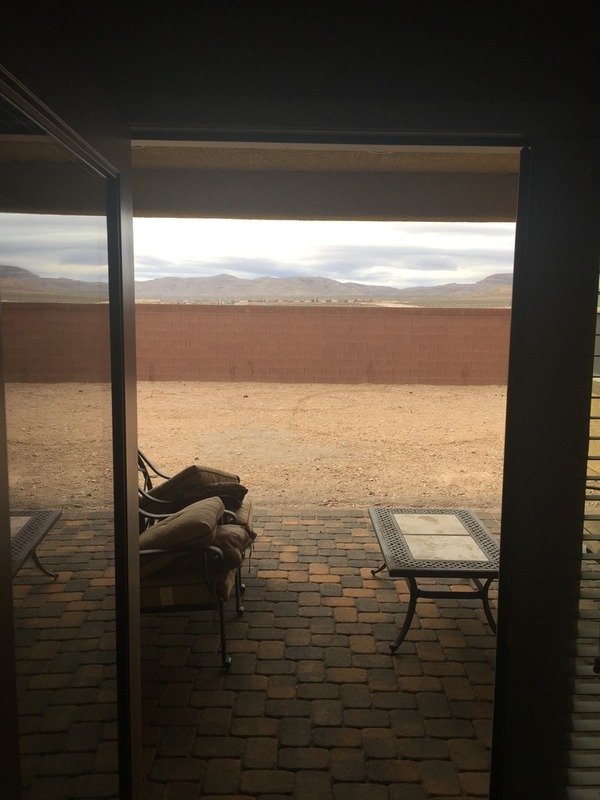 A little about us- we have 3 kids ages 6,9,11 and we just want to build a nice pool where we can cool off in this desert heat and have a nice entertaining area. 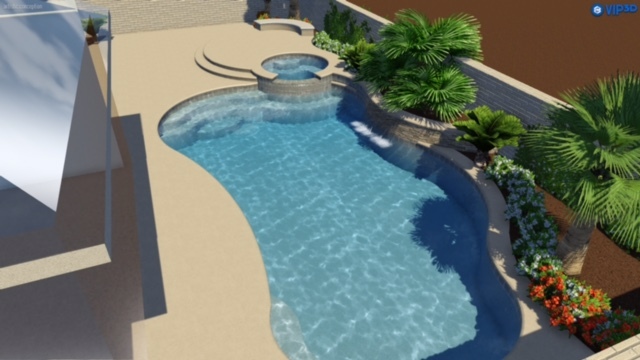 The pool we are looking at is a free form 33x17 with a raised spa and a raised planter with a water feature and adding an additional 650-700sqft of decking. I will post pics below so please dissect the build and ALL feedback is welcome. I am still new to some of the pool terminology and I have alot of questions so please bare with me as I am learning. 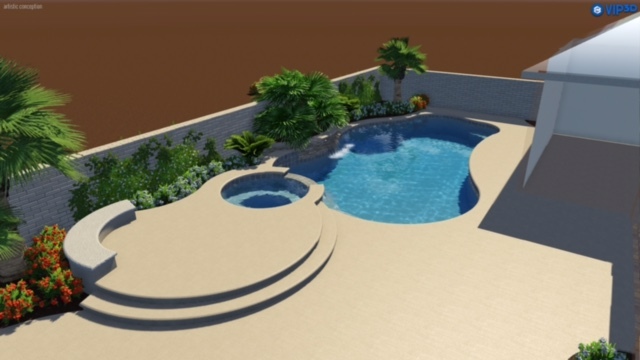 Totally my personal opinion here but I would ditch the raised spa and just have a giant sun shelf with bubblers and make the pool more of a rectangular shape (or do some Grecian corners). Again, just my opinion but attached spas are kind of whimpy and really just places for the adults to sit. If you want therapy, you really need a separate hot tub. As for the rectangular shape, it's A LOT easier to cover a rectangular pool with a bubble cover than it is a free form pool. 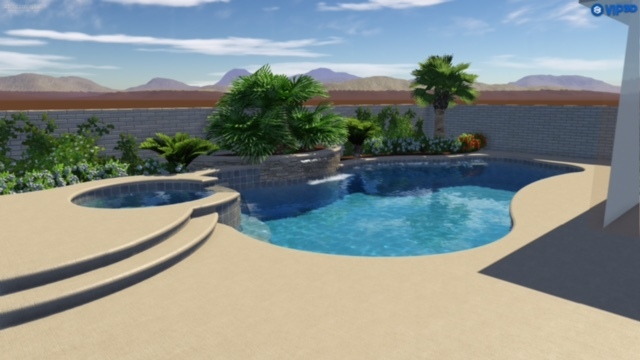 With evaporation rates that you get in the desert (take it from me, I live in the hottest and driest place on the planet), you will save a TON of money on water bills by being able to properly cover your pool. It also makes an eventual solar heating installation much better when you can properly cover your pool. Many people find using a bubble cover on a freeform next to impossible and then just don't bother using one. 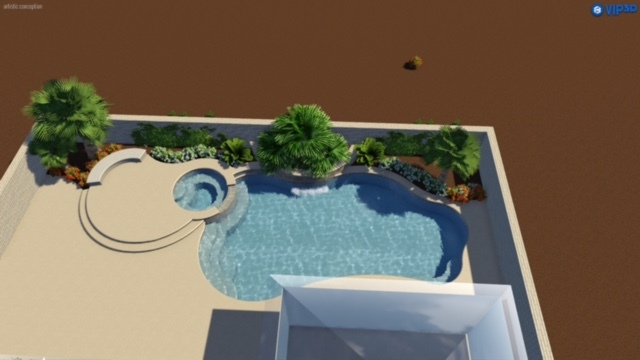 Once you uncover your pool, all that heat you can potentially build up in the cooler months (March/April and October/November) just evaporates away. Again, the above is personal opinion. I'm sure you'll have a wonderful space no matter what you do. So we kinda kicked around the idea of a sun shelf, however, we feel like we would never use it and it takes away from swim/play space especially with the backyards in vegas not being overly big ( were from so cal ) Also i dont like sitting in the sun and i already have a perfect caramel tan . Also we thought about going sloar since Vegas is sun 360 days a year but changed that as well when we committed to doing an owner build and adding a spa since we will save some $$$. I'm sure Brian and Jim will be by soon to take me to task for trying to lead you astray I'm very much a ScreenLogic apostate as I march to the beat of a different drummer (it involves 80's music). Brian and Jim are the automation experts and they will give you the very best advice on exactly what you need. I'm glad you're able to go OB as it will get you so much more pool for your money. I have a raised spa and so my comments about them come from my experience of not really using it as much as I thought I would. I also have four small kids (11, 8, 4-/12 and 11 months) and I know they'd have way more fun with a sun shelf and bubblers than they currently do with the spa. But that's just my experience now, perhaps my spa will see more use in the future and I'll appreciate it more. Do reconsider the shape of the pool. You don't necessarily have to go to a rectangle but if you minimize the tight radii of the free form shape, then a cover is a lot easier to imagine. Believe me, evaporation has a HUGE impact on water chemistry and your wallet not to mention making a pool harder to heat. A cover is an absolute must have if you want to get your pool swimmable in the elbow months and not put yourself in the poor-house with massive gas and water bills. Just something to think about. Would you be so kind as to draw out a few examples on a post it or even a old piece of garbage lol. 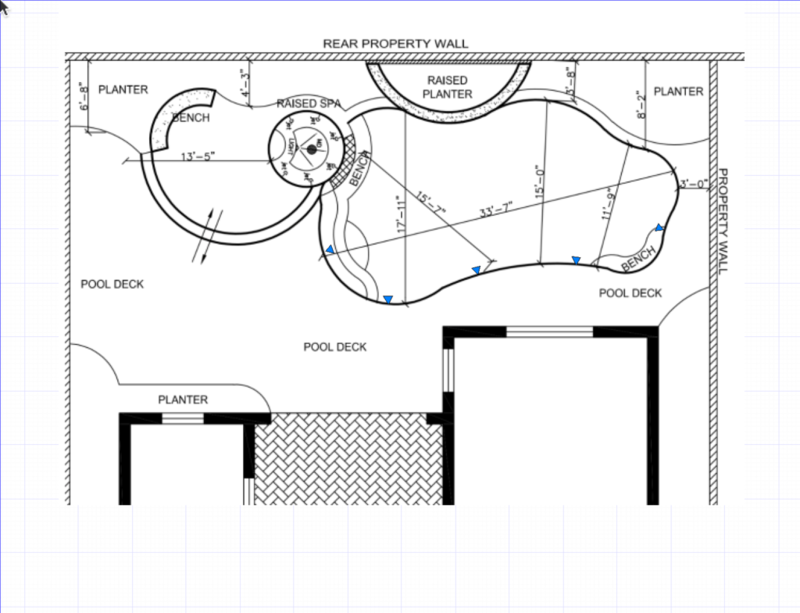 But seriously I'm a visual person and what your saying makes sense but not sure how I could make it less curvy and still keep it as a "free form" my neighbor has a geometric pool so I don't want to be a copy cat. 1. Appearance. Instead of having a bunch of different boxes hanging on your wall you have one, professional looking enclosure. 2. Circuit Breaker Panel (Load Center). 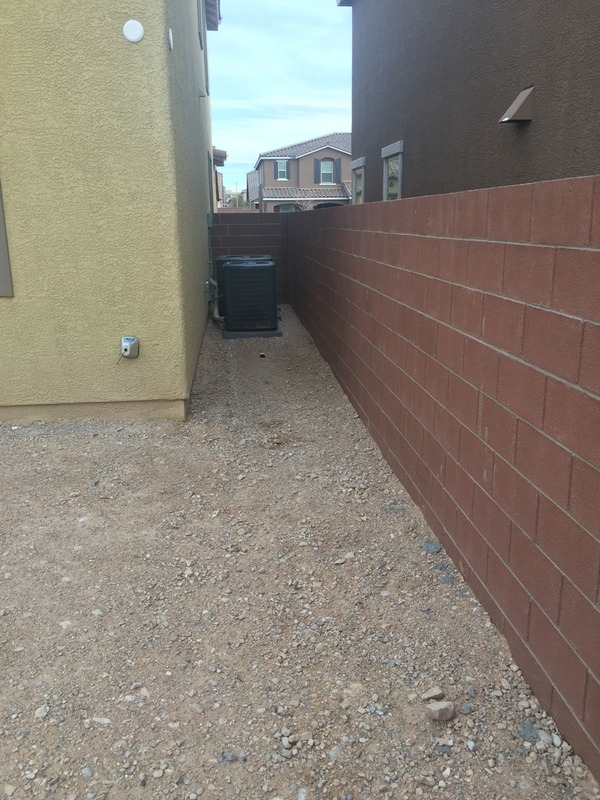 The bottom half of the enclosure is a circuit-breaker panel where the breakers for your pool equipment (Pumps, Heater, etc.) are located. This panel is also an excellent place to add surge protector, which is an absolute must if you have the Intelliflo pump. Even if you do not get the automation, make sure your PB includes a surge protector for the pump. 3. SWG Control. Without automation, your SWG will have to have a timer, synced to the pump timer so that it does not run when the pump is off. This function is built into the EasyTouch. 4. Spa mode and SWG output. Normally all the water flows through the SWG, so when in the Spa mode, the EasyTouch reduces the amount of chlorine the SWG produces, so that the Spa users are not subjected to high levels of chlorine. 5. Pool Lighting. The EasyTouch allows you to control your pool lighting from your PC and/or from a schedule. This is another reason to add the EasyTouch now. Once your pool light is wired to switches inside your house, it might be very difficult to get the wiring to any automation system. 6. Control of Spill-over and bubblers. Right now I'm sure you are thinking I want that spillover running 24-hours a day because it is so beautiful.. Well, after a few weeks of having your pH go through the roof, you'll appreciate the ability to only turn it on, when you want it on. The same with the bubblers. With the Easytouch, you can program them to run on a schedule for a few minutes a day to keep the everything properly chlorinated or when you want to "show off" to your guests..
7. Relay Control. The EasyTouch 4 has four (really three) relays that can be used to control other things, such as landscape lights. (The EasyTouch has 8 (really 7) relays. 8. Built in Valve controls. The EasyTouch has the ability to control 4 valves. Two work for switching between the Pool and Spa modes, while two others can be programmed to do whatever you might want, like bubbler control. I would note that a lot of bubblers are controlled by manual valves that cannot be automated. You need to be sure to tell your PB that you want Jandy style valves for your bubbler control. 9. Heater Control. The EasyTouch can control your heater.. So, you can be inside and tell your PC what temperature you want the Spa to be and it will tell you when it is ready. 10. ScreenLogic. ScreenLogic allows you to program the EasyTouch with various schedules. It lets you see most all of the inputs and output to the EasyTouch and lets you decide what you want on/off and in the case of your SWG, lets you adjust the % of output on the fly. Jim thank you for the detailed post! Automation makes much more sense to me now and this will be a good reference point for when I go buy my equipment. Question- does the load center come with the ez touch/ screen logic bundle or is that something I have to purchase separately? 2. If I'm not doing bubblers do I need to go ez 8? I'm just trying to figure out exactly which equipment to purchase for my needs. Matt is correct from a simplicity and efficiency standpoint but don't let that be your total persuasion. A pool should be enjoyed and be visually pleasing. I imagine you went back and forth on several design changes and ultimately settled on this. There is nothing wrong with what you have planned. I love my attached spa and would not build a pool without one. If you see yourself using it then go for it but if you are doing it because everyone else has one, there is no trouble getting rid of it. 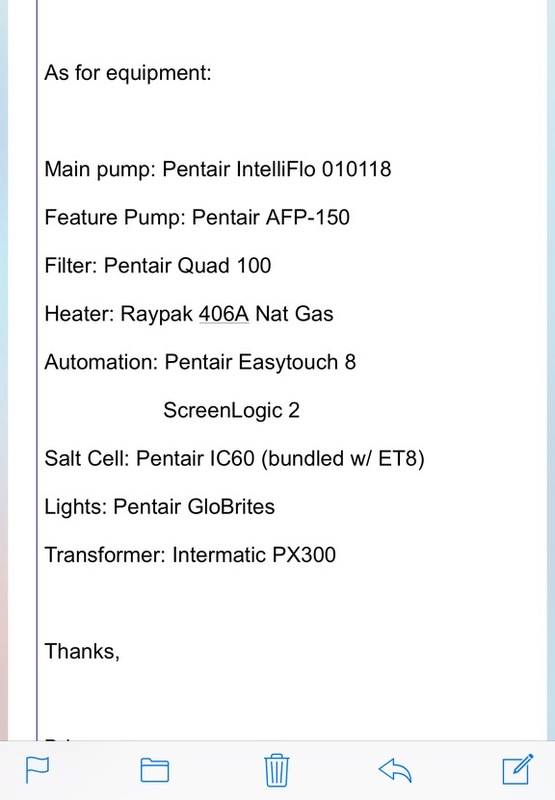 Pentair is coming out with a new automation system that will likely have an updated wifi interface. There isn't much information out on it but being where you are at your stage of the build may be worth taking things slow. Well I don't listen to A tracks anymore so I definitely want automation but just to clarify I just don't need every bell and whistle. Just get me to the Apple Watch level so I can control my pool and actually understand and use what I have on a basic level not a Brian level. I just don't want to pay for features I may never use just cause there cool to have unless I get a deal to good to pass up. Also is there a projected release date on the new pentair automation? What Brian doesn't like to admit is that he needs me. I am his counter-example, his foil, I am the antagonist to his protagonist. I am the Mephistopheles to his Faust. Without me, his job would be so boring...but a time is coming where he will have to make payment on his bargain...ok, ok, enough with the bad English Lit tangents. So a question I have is do you use the cover during the hot months or only during the winter months? It's getting late for Jim. He's gotta provide his insight and then charge his batteries for tomorrow when another battle ensues with you over the merits of technology. Well you have gone a done it! You started your pool build! SWEET! -place to put eye catching BLING-YES! There is NOTHING I would change! We will look at that last light and see what others think. I don't know must how bright those lights are so it may be a non-issue. Will there be lighting up on the spa decking? I am guessing you will have a fire pit up there with comfy seating for me to curl up in. 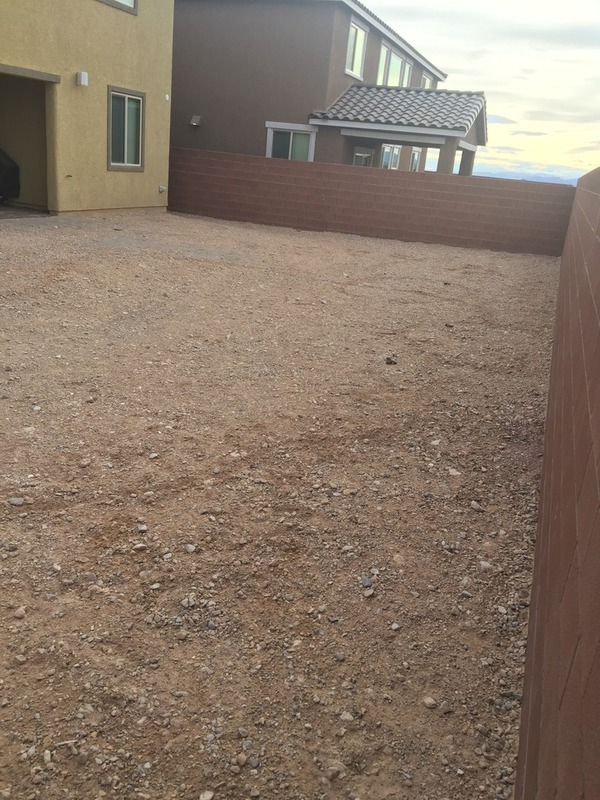 What about lighting for the landscaping? These could all go in the system y'all come up with. What are you thinking for color and material? Does your wife have any ideas yet? Do you? 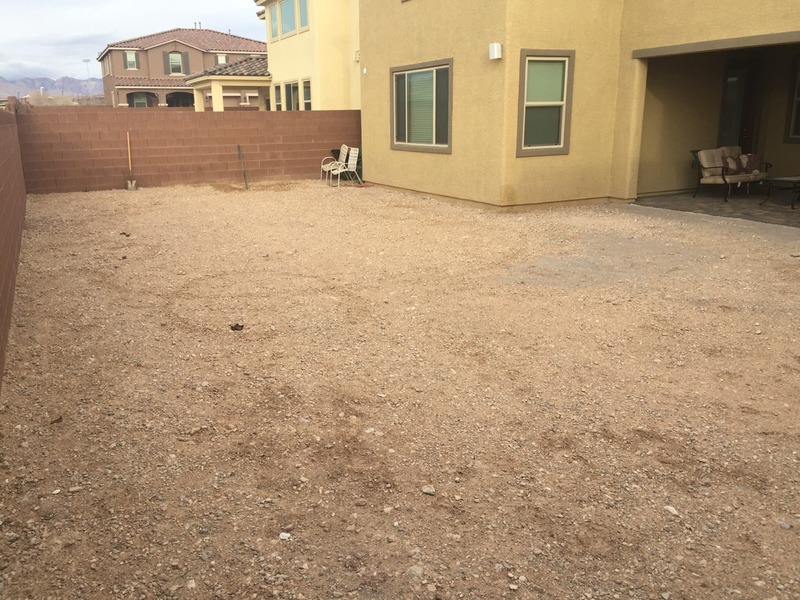 There is one picture missing-pic of where the pool will be going. Do the kids know what you are planning? The lower 3/4 of the enclosure is where all the incoming and outgoing electrical connections are made. The upper portion of the enclosure is where the electronic package is located. With the cover removed from the circuit breakers, you can see that this is an EasyTouch 4 by the fact that there is a row of 4 relays just under the electronics package. You want an EasyTouch 8 because 4 relays are just not enough. You can see that an additional relay has been added. You can also see, because of the very big transformer on the right side, that this EasyTouch has the built-in power supply for the SWCG. In the lower right side you can see a standard GFCI outlet. This outlet does not come with the EasyTouch and is usually added by the installer. The enclosure comes with the electronics package, but none of the circuit breakers. Also, as the bottom of the circuit breakers you can see a surge protector.. there are many different types, this one snaps into one of the circuit breaker slots. Please let me know if you have any more questions..
ScreenLogic is a computer program that communicates with the EasyTouch and allows you to use your PC, Tablet, or Phone to view the status of your pool, and turn things on and off. To do this, a device called a Protocol Adapter is used. It "talks" Pentair at one end and Ethernet at the other end. It basically translates the language that Pentair uses into something the Ethernet understands. The Protocol adapter can be connected one of two ways. You can use a wireless connection that uses two transceivers.. One is mounted to the EasyTouch and the other is inside the house. If you look at the pics above you will not see a Transceiver because I have used the direct wire method. I just ran a four wire cable from the EasyTouch to the Protocol Adapter, mainly because my EasyTouch is just a few feet from my Ethernet Router. Buying an EasyTouch without ScreenLogic is like buying a car without tires!! Although there are some here, who still believe in the Flintstone method of using Pentair remotes... Sigh!!! Love the drawing on the "grass". I'm going to guess chihuahua's and small children are it's favorite thing to eat...annoying neighbors and the Postman are a close second. Thieves and robbers for desert. 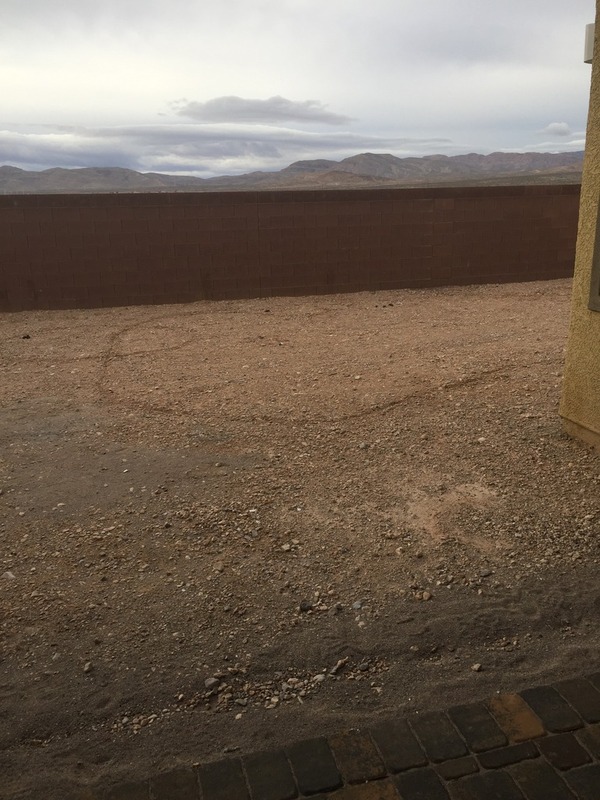 New Build in Vegas Starts Today!